Oak Tree Farm is a wonderful community in the prestigious city of Lee’s Summit, Missouri. 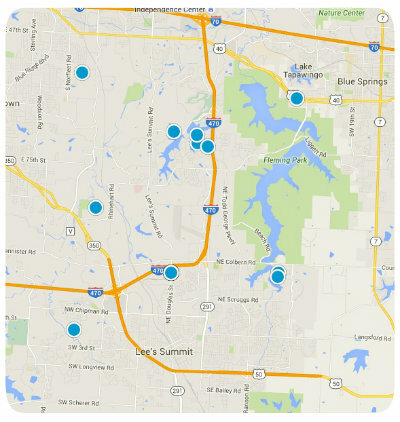 Lee’s Summit continues to be a popular destination among buyers looking to relocate in the Kansas City Metro area. Because of its popularity you might expect real estate prices to be out of reach, but Lee’s Summit is home to a plethora of luxurious yet affordable homes in impressive neighborhoods and subdivisions. Oak Tree Farm is one such community. Oak Tree Farm is comprised of 374 homes in a peaceful community that was first developed in the mid 1970’s. Homes in Oak Tree Farm are of varying architectural styles and layouts and boast gorgeous mature trees. Oak Tree Farm provides its residents with many wonderful shared amenities including a pool, tennis courts and a clubhouse. This family friendly community also holds several annual events to keep its residents engaged and entertained. A few of the locals’ favorite events include Santa at the clubhouse and the annual Easter egg hunt. Oak Tree Farm is located off of Langsford Road and has an active HOA. Homes for sale in Oak Tree Farm vary in price depending upon the property’s age, size, style and special features. While the median listing price for a home in Oak Tree Farm is around $200,250, or $75 per square foot, there are homes for as little as $130,000. If you would like to buy a home in Oak Tree Farm of Lee’s Summit, Missouri, or if you have questions regarding other real estate options in Lee’s Summit, please do not hesitate to contact us today. Listing courtesy of Mike Watterson of Watterson Realty & Auction.